Tetlow King Planning (TKP) helped GreenSquare and Ashville Calne Ltd to achieve planning permission for 34 affordable homes on a 0.7 hectare site at Calne. 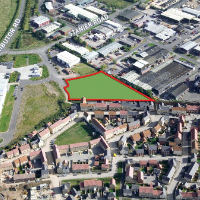 The site is a rough triangle of grassland sandwiched between an industrial estate and a housing estate. The Council had refused planning permission principally because the site had been long identified as being required for development for employment purposes. The Inspector accepted the evidence presented at the hearing that the site had been consistently marketed without success for over 10 years and that there was an ample supply of employment land in Calne. During the appeal process, TKP successfully persuaded the Council to withdraw its requests for off-site financial contributions towards leisure and education requirements and to reduce its request for maintenance of off-site public open space from £92,000 to £27,000. The total savings to the appellant amounted to £182,000. This was achieved without having to prepare a viability appraisal. A further issue was potential noise from adjacent industrial premises. Evidence was presented that existing residents live quite easily with similar levels of noise and the mitigation measures proposed. TKP provided evidence on the need for affordable housing across the County and at Calne; and that the Council did not have an overall five year housing land supply. The Inspector allowed the appeal, commenting that the development would act as a catalyst for GreenSquare’s plan to upgrade its existing accommodation in the locality and would generate “significant community benefits”, which in any event would have been sufficient to outweigh “any lingering doubts over land supply and noise”.